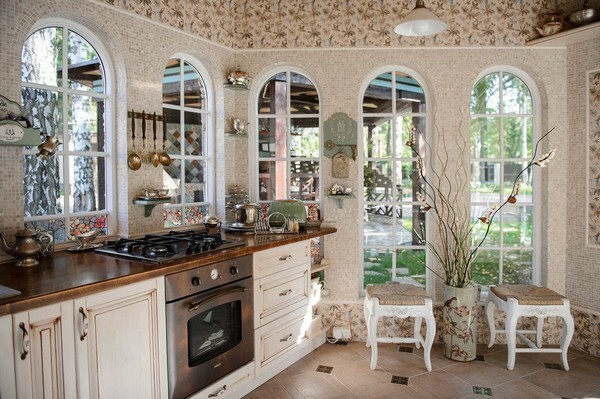 In the previous post we have enjoyed a wonderful designer project of a beige-and-turquoise sauna. But it wasn’t just sauna that the master of the house had renovated. She also hired a pro to refresh her three beautiful garden gazebos. Let’s see what they look like. The author of gazebo project is the same as the sauna’s. 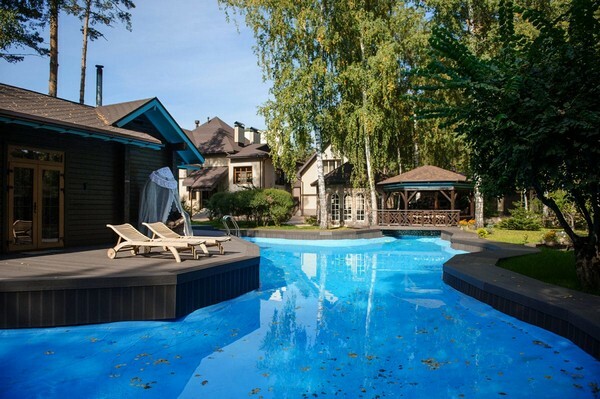 As you remember, the color scheme of sauna was beige and turquoise, which was inspired by the color of the big outdoor swimming pool in the centre of the territory, on the one hand, and by the desire to soften it with a warmer and smoother color – beige in this case. The same principle was applied to exteriors and interiors of the gazebos. 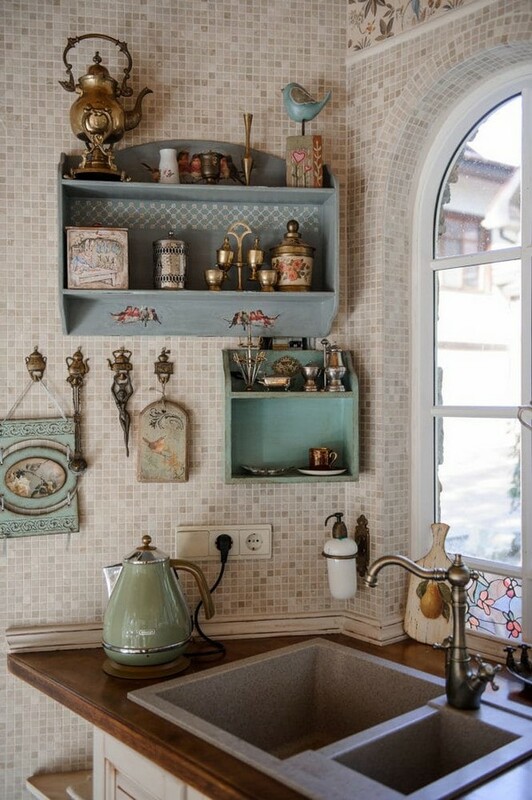 Outside they are coated with deep chocolate paint and decorated with turquoise insertions, and inside turquoise hints are more subtle and pale and serve as an accent against a neutral pastel beige background. 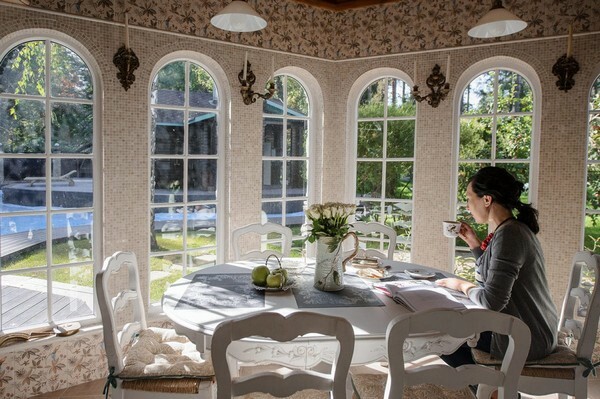 The most favorite gazebo of the hostess is glazed and nicknamed “The Bird’s House”. Just as in the interiors of the sauna rooms, bird theme is obviously dominating in the summer houses as well. 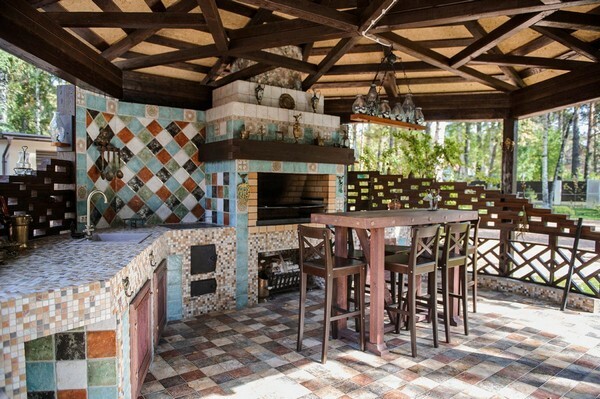 In case of this very gazebo the starting point of its interior was the bird pattern on tiles by Kerama Marazzi, which the client fell in love with. 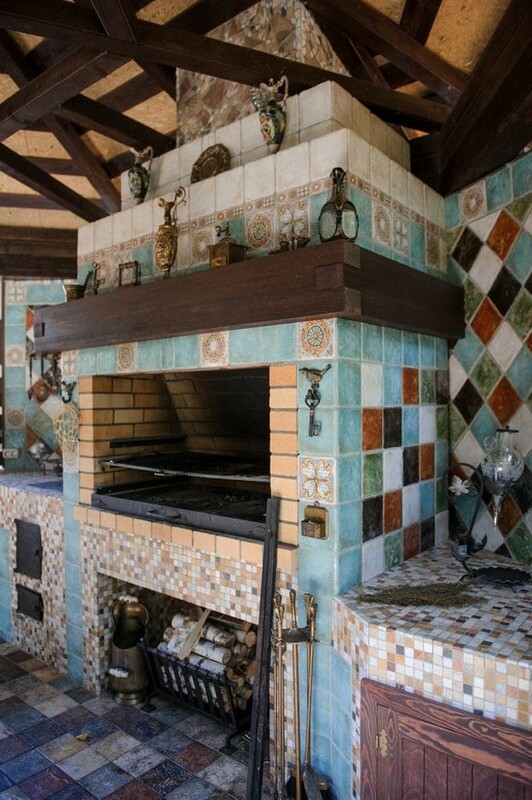 Top and bottom parts of the walls are laid with these lovely tiles along the entire perimeter of the house. While the background is comprised of marble mosaic by Boticcino, which perfectly fit into the beige-and-turquoise concept and besides appeared to be very practical for such a complex shape of the surface. 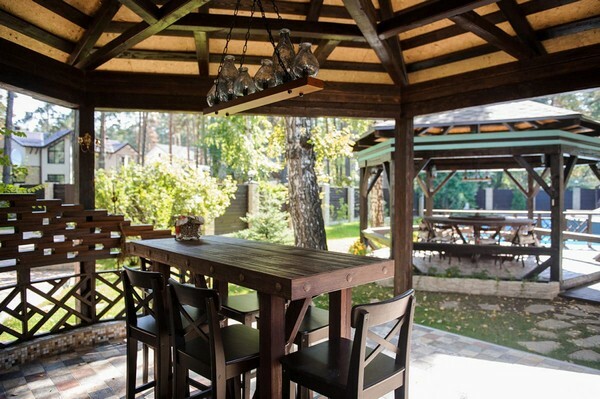 This gazebo used to serve as a summer kitchen before renovation as well. 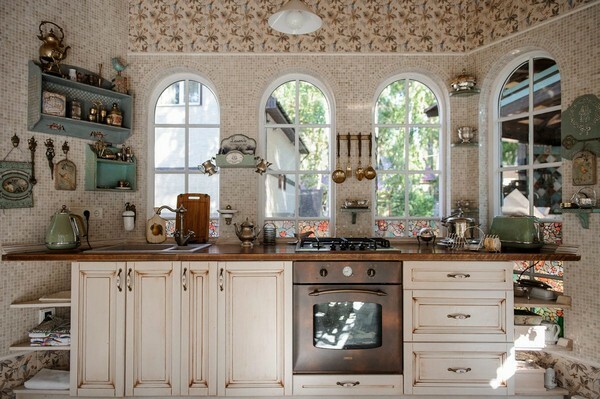 The kitchen set came through the previous owners of the house and proved to be ideal both from color scheme and vintage style aspects. The only thing changed was a couple of additional decoupaged shelves. And of course, a retro-style kitchenette couldn’t do without a refrigerator by Smeg. But the centerpiece of the room is the windows. 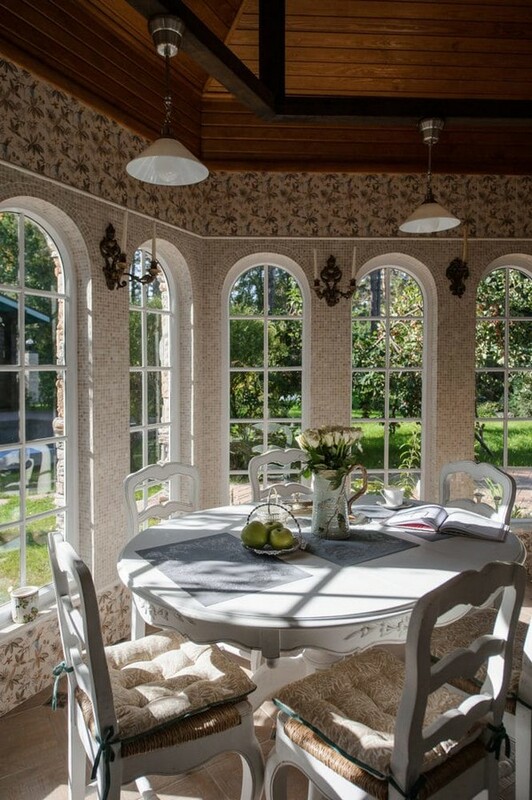 They are especially gorgeous in the morning, when the dining zone is lit by airy sunlight and shades of the muntins create beautiful lattice patterns. It’s truly ideal for breakfasts. 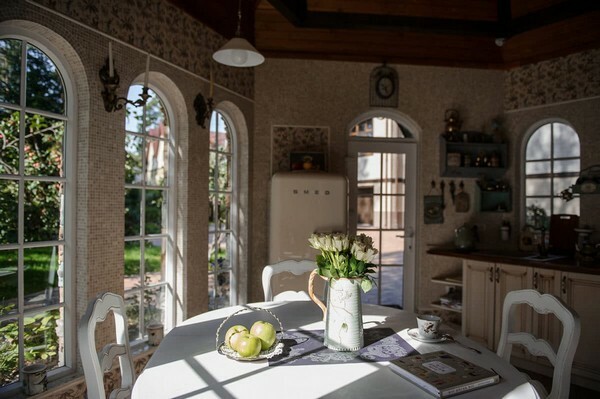 And the good old family feeling is enhanced by vintage tableware from the hostess’s collection – it can even boast a few exhibits from the 19th century. 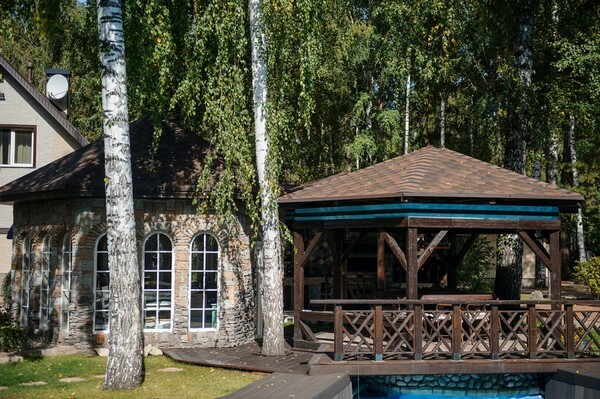 The second gazebo, with a barbecue, was built from scratch. A stove was the first to appear here. 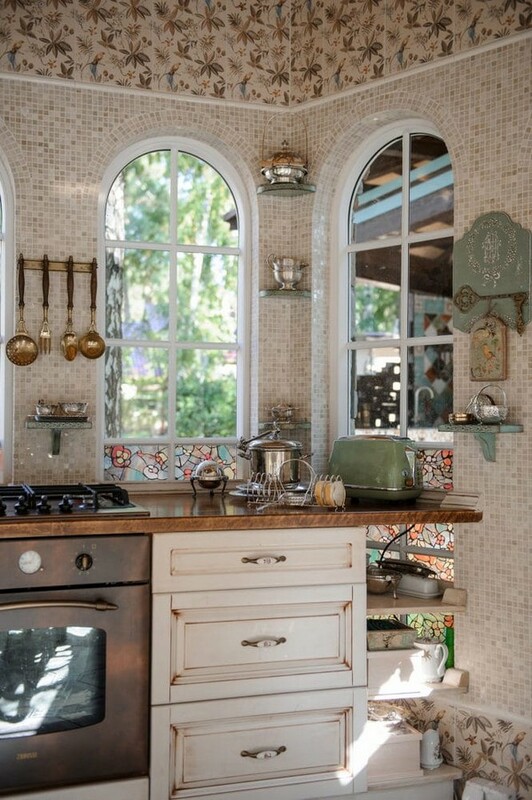 It includes separate zones for preparing barbecue and pilaf, a sink and a large cooking zone. A bar table was custom-made and coupled with re-painted IKEA bar stools. 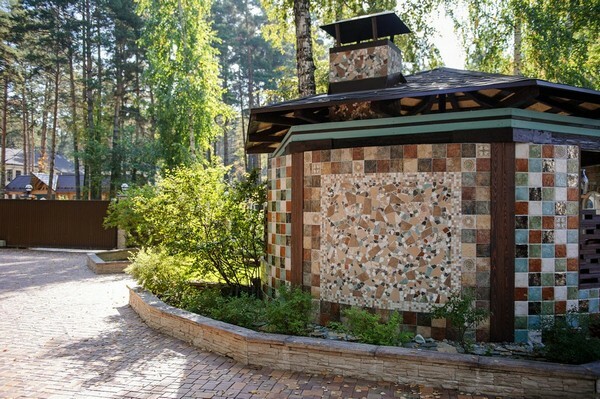 Just like in the sauna, all the surfaces of gazebo are faced with a mixture of ceramic tiles and mosaics. 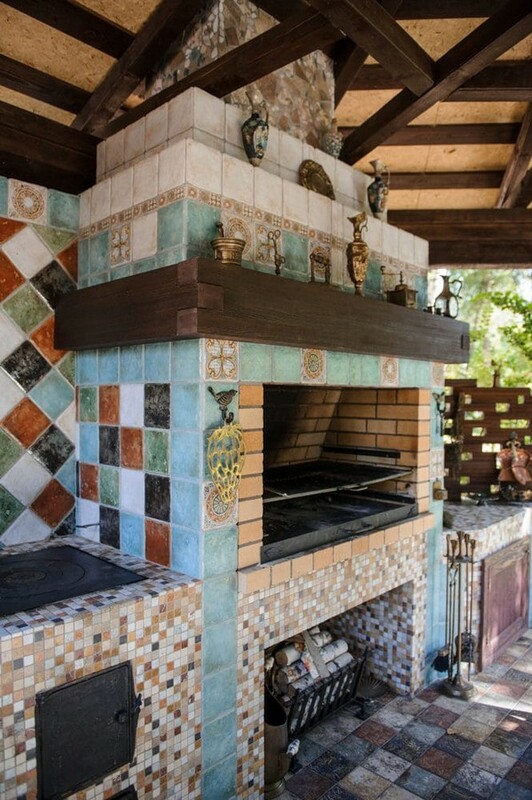 And the exterior part is fancifully decorated with small pieces of mosaics and broken tiles in style of Gaudi. And finally, the third gazebo. It remained practically unchanged. Its centerpiece is a bespoke grand rotating round table. Both gazebos are lit by chandeliers with grayish blue glass globes.